Page-by-page SEO optimisation and ranking checks without the need to employ professionals! For any business, an active on-page SEO is the foundation for an effective online marketing strategy. Once all the page factors have been search engine optimised, an on-page SEO checker is essential to update your content to maintain and improve your rank in search engine rankings. With almost two decades of experience in the e-commerce industry and digital marketing tools design, 4Sprung offers a unique solution that guarantees on-site SEO optimisation and high ranks for your website and web pages, without adding to your budget. 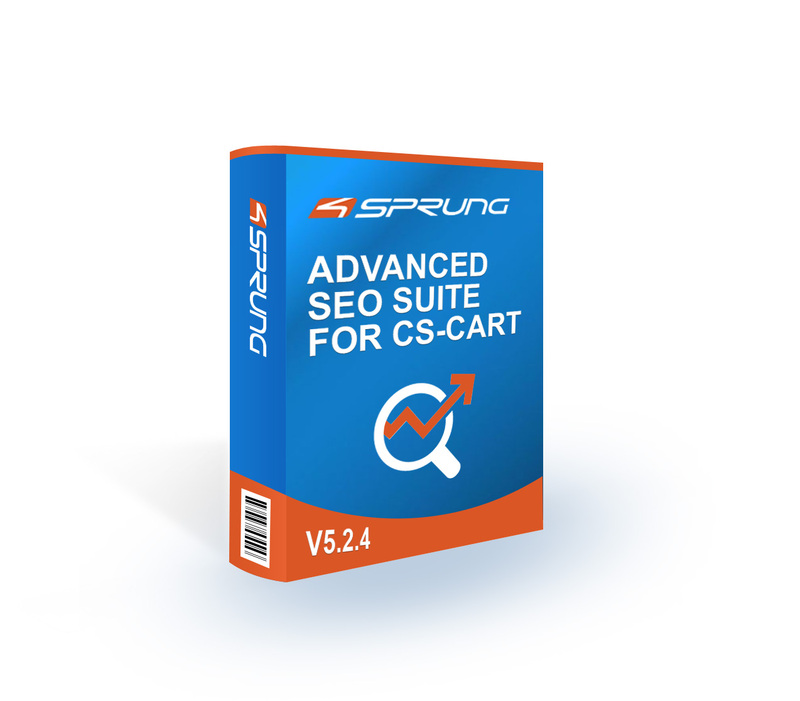 Unlike the previous Advanced SEO version, the 5th version comes with an automatic installer. The product is delivered within 24-48 business hours of placing an order and can be easily installed on any Linux/Unix* server, without the need of any technical assistance or professional installation services. So save up on your costs and, simply click, download upload to your server and install in a flash! The installation process is completed within 2 minutes and a instruction video is available. *On a Microsoft Server our install script unfortunately can't run and you will need to make manual changes to two files. 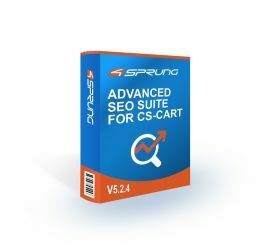 The 5th version is a complete overhaul and rewrite of the code base of the previous CS Cart Advances SEO Suit version. The new version includes major bug fixes, better user interface and improved compatibility with changes made in the CS Cart Framework. The new version also takes in to account the latest google algorithm changes. With the Custom 404 Page, re-engaging your customers and preventing bounce-offs is easier. The Custom 404 Page includes several content options that allow you to tailor-make your website as per your needs. Through this feature, you can add a small paragraph, multiple images or even a use Cs Cart’s built in HTML sitemap. For any website, videos and graphics are crucial for customer retention and lead generation. They are equally important for SEO optimisation purposes. 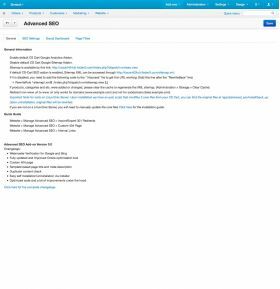 The video sitemap feature included in the Advanced SEO Suit automatically generates a Google compatible sitemap and saves it as an .xml file onto your system which is automatically updated when you post new videos. You can then submit the file to Google via Googles web master tools. The 4SEO Version 5 provides a number of tips and useful suggestions with respect to improving the SEO ranking by way of optimising the keywords, Meta descriptions, tags and other features. The interlinking tool allows you better access and control over your website’s internal links. This feature can automatically insert relevant pages to page links, select and design the anchor text and give you better control on the overall internal linking scheme of your website. With 4SEO, you need not hire an expert to decide text placement and other features on your website. The intuitive suggestion module makes your web optimisation easy. It offers detailed advice on all keywords, headings, keyword density, Meta keywords, internal links, images and Meta descriptions for better optimisation. This will help you create all-rounded optimised product pages and not miss important details that can improve your SEO score. This useful tool prevents you from over or under optimising your web pages and keep a check and balance in this regard. The Advanced SEO Dashboard, on the left hand side of the screen, displays your current SEO Score and keyword density to guide your overall optimisation process in a better manner. Do you have many hundreds or thousands of product pages that you cannot manage individually? Then let 4SEO simplify things for you. This add-on helps you save both, time and effort, by setting up default short codes for your categories, sub-categories and product pages. The new 301 redirect feature allows you to both, import and export, bulk 301 redirects with just a few steps. These involve entering the old URL for your website, the new URL and the type of page, which can be a product, category or custom page. If you have a large amount of web pages, which need optimisation, then our auto-fill option works wonders. Using the first 164 characters from your product description, 4SEO generates relevant and precise Meta content that guarantees an improved SEO score for all web pages. By doing so, you can save up on the time and costs of hiring SEO experts and content writers for the job while obtaining a high-ranking and quality-assured SEO content for your product and other web pages. Similarly, the advanced SEO add-on for CS cart allows you to use multiple Meta tags like Meta Robot Follow or No-follow, no Archive, no Snippet and several more. For mid-sized and rapidly expanding e-commerce stores, a duplicate content issue may arise. The in-site duplication can adversely affect your SEO ranking since search engines (particularly Google) penalizes duplicate content. With the help of 4SEO, canonical URLs can easily be assigned that prevent duplicate content from arising – thereby preventing your ranking from falling. Such URLs request Google to index a specific URL and leave the shadow page as it is. Page titles are undoubtedly one of the most important on-page SEO factors. Well formatted and unique page titles get you additional traffic and help you target more keywords simultaneously. The duplicate title checker automatically scans for duplicate page titles across the website and gives you a list of URLs along with the duplicate titles. You can then manually inspect every URL and make changes accordingly. Having an over-optimised website for your business is as devastating as having an under-optimised one. With the change in search engine algorithms and industrial practices over the years, the ranking mechanisms have changed drastically. 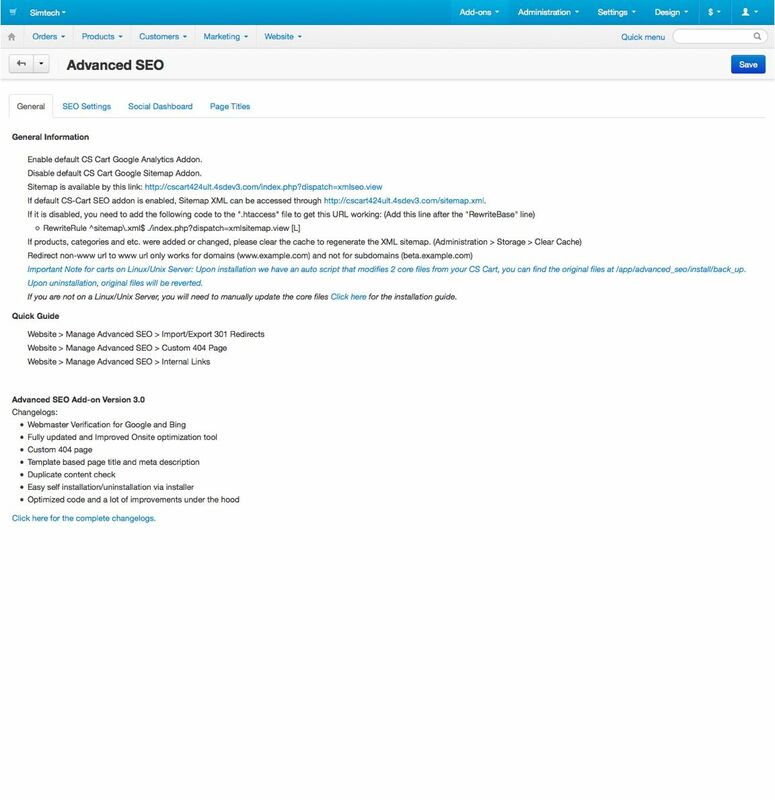 SEO Advanced Version 5 comes with a feature that warns you when you go overboard with SEO. This helps you select and place the right keywords with the right density throughout your web copies and save your website from falling below the ranks. The advanced SEO add-on for the CS cart allows you to use multiple Meta tags like Meta Robot Follow or No-follow, no Archive, no Snippet and several more. You can set these Meta tags on category level or page level as you please. Facebook is all about people sharing stories about their daily activities and keeping in touch with one another. 4SEO helps integrate all your apps with Facebook, which allows better engagement, distribution and growth of information and customer-base. The Open Graph feature lets all the apps share stories on Facebook, by means of a structured and well-typed API. With the help of the Twitter Cards feature, you can easily attach media experiences onto your Twitter account with links to your content. With the help of this code, Twitter users and your followers who Tweet links to your content, will have a card added to the Tweet that is seen by others. The Webmaster Verification module also aids with the site and domain ownership authentication and verification for Google and Bing search engines. The updated version of SEO Advanced V5 allows you to link your content via Tweets with the help of Twitter cards. 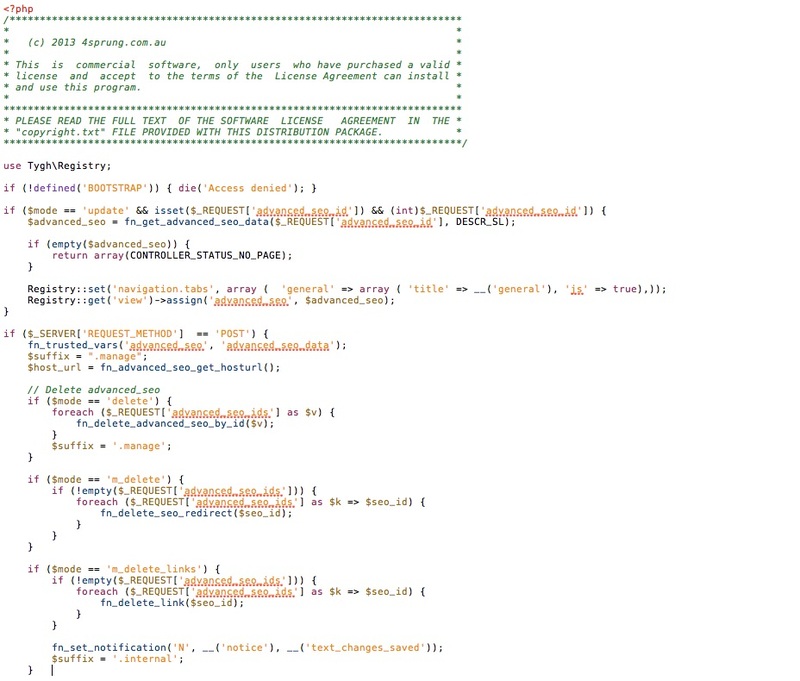 These allow you to share media experiences on Twitter with an attached code. The code will generate a card on each Tweet that users can link to your content, making it visible to all their followers. Now get keyword suggestions in real time, with 4SEO! 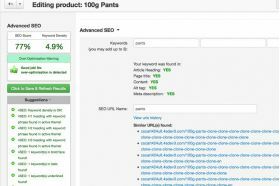 The LSI keyword tool gets keyword suggestions directly from search engines and lists important keywords that you should be targeting. 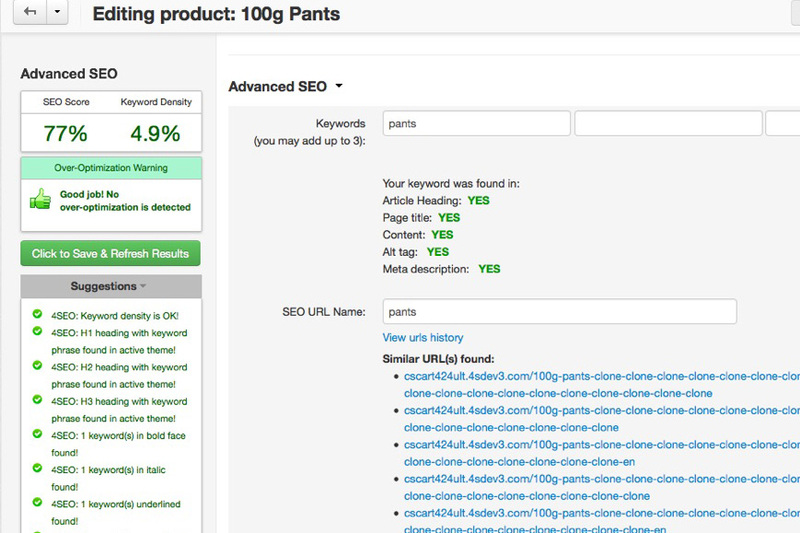 The LSI feature also generates close keyword matches, long tail keyword suggestions and synonyms. You can incorporate these keywords in your page titles, headings and body text, and create a perfectly optimised page that not only will rank well but will also get you additional converting traffic via long tailed keywords. Our product is 100% guaranteed to work on a standard CS Cart installation. We cannot guarantee compatibility with core modifications or 3rd part add-ons. If you should run in to issues we can try to customise the add-on, at an extra cost, to take your modifications in to account but can't gurantee this will work in every case especialy if the 3rd party addon is encrypted. If you run multiple stores on the same backend you will need a licence for each store, you can not use the addon only for selected domains on a multi store installation. The add-on comes with 6 month free support and updates after this you would need to purchase a 12 month support and update plan to receive further support and updates. With the most advanced SEO tools offered, the 4SEO CS-Cart Add-on revolutionises your digital marketing experience by helping you improve your search engine rankings and keeping you on top of all the search results. Click here to place an order and let the all-in-one SEO expert take care of all your e-commerce needs! "Thank you. We are in love with our website after installing your addone.Everything we had hoped for!Some times we feels its more than that ! You have helped us take our website to the next level. Your patience, creativity & intuition have been a pleasure to work with.We are so grateful for your informative guidance, patience and responsiveness, You thoughtfully created an environment which challenged us to define our product and consequently our customers. We are already well on our way to recommending 4sprung and your services as much as we can." Thank You So Much Team 4sprung. Looking For more Addone's from you in future. This addon for SEO is an essential product that is brilliant and will guide you through to the best SEO results that can be achieved....!! Easy to use and great help from the company. I do not know why every person with a website would not use this. Save $1000's as no need to employ or contract people to help you with SEO as this does it all......brilliant job! 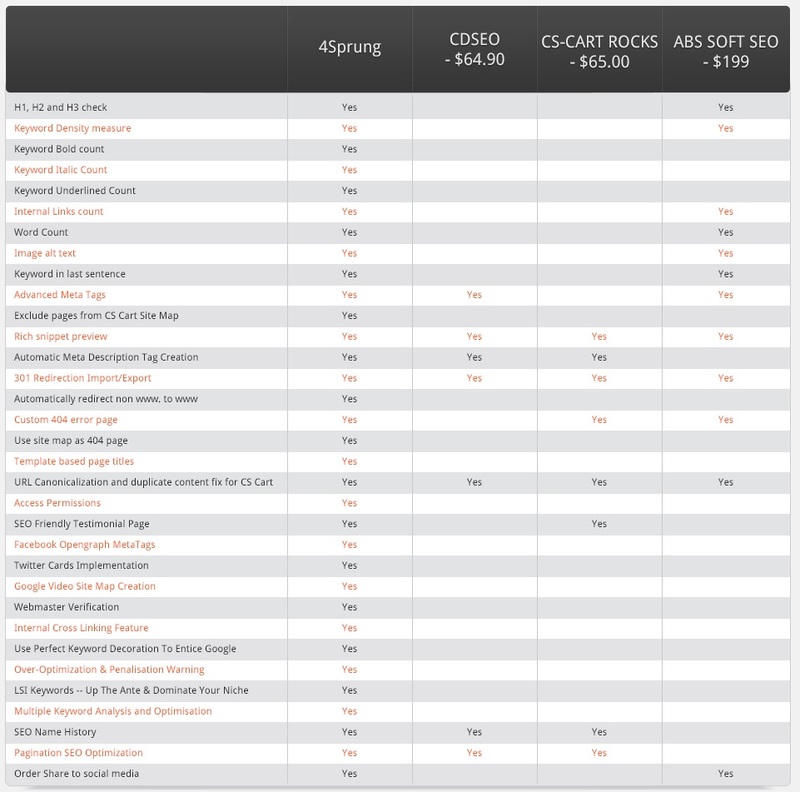 I've used Advanced SEO by 4Sprung since version 1, for about two years now. It has been a valuable asset to my CS-Cart store and assisted me with optimizing my products for keyword density and more. 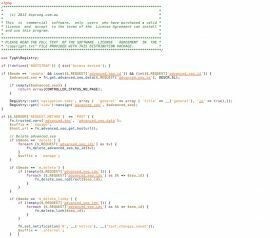 With version 1, I still had to do much of the meta tag tweaks and Rich Snippets myself. I just upgraded to this new version for my CS-Cart v4 build and with all of it's new features there's a lot less work for me to do! Highly recommended. Pays for itself in "time saved" and SE results. We are using this addon for the website http://www.sibero.nl A great tool for the best seo optimization. Highly recommended for everybody for the best price. great add-on we are using it for our web site http://www.shockdoctor.com.au/ and it helped us to improve our rankings dramatically. Well worth the money and the new update makes it even better. I realy like the over optimisation warning!